Voltcom Crescent Suzuki is delighted to welcome Objektum Modernization on-board as a team partner for its assault on the 2014 eni FIM Superbike World Championship. 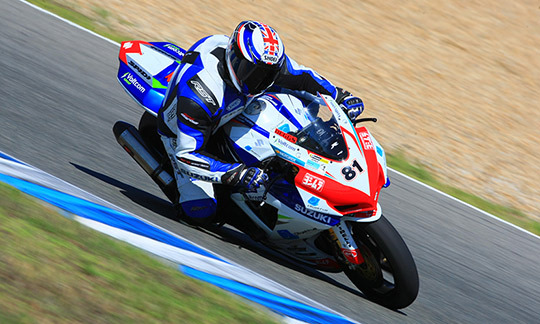 Objektum is an innovative and dynamic software engineering company with a global reach and it’s this business model that creates a perfect fit with the fast-paced world of motorcycle racing. Objektum’s drive for excellence in serving a demanding world-wide network while maintaining their solid UK roots yields a perfect synergy with Crescent Racing’s ethos and history. Following a long-standing relationship between the two companies, the formalised partnership for 2014 will allow the bond to develop further, providing opportunities to network on a world-wide basis at the track, via the championship’s television and social media coverage and through the team’s wider sponsor partner associations. Objektum Modernization’s logo will feature on the new livery of the Yoshimura-powered GSX-R for the first time at the official unveiling of the machine early next month and will be seen in track-action at the opening round of the season at Phillip Island in Australia on Sunday 23rd February. “2014 promises to be an exciting year for us and joining the Voltcom Crescent Suzuki WSBK team is a fantastic opportunity. We see great value in partnering the team, not only due to our personal interest in motorbikes but we also believe the association could help us increase our clientele. We are looking to globally expand our brand and we have already seen benefits. It hasn’t been too long since we made the decision to join the team and we can already see results, liaising with new clients and gaining potential business, as well as maintaining clientele relationships. Recently we successfully completed a large contract in Wellington, New Zealand, and the sponsorship has allowed an opportunity for us to invite several of our customers (and potential customers) to the Phillip Island Race in February. This entry was posted in Announcement by Objektum. Bookmark the permalink.